Born: August 28, 1847 in Bedford N.H.
To: Annie A. Cook; (1853 – 1925) (Thomas Franklin Burgess Cook & Ellen Frances Fowler); Annie married (2) John F. Giles (Abt.1840 – ?) (John C. Giles & Mary B. Butterfield) in Boston Ma. on September 6, 1904. 1. 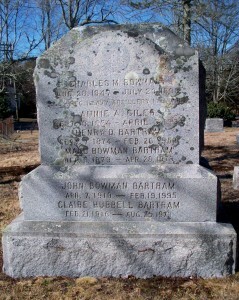 Maud F. Bowman Bartram; (December 6, 1879 – April 28, 1973); Married Henry D. Bartram (1874 – 1953) (William M. Bartram & Eliza J. Corrie) in Boston Ma. on April 16, 1904; Maud & Henry are buried in Pocasset Cemetery.